EffecTech has been awarded ISO 17025 accreditation from UKAS for the calibration of Liquefied Natural Gas (LNG) analysers. The calibration method uses reference liquid mixtures which are prepared cryogenically in a bespoke cryostat. This accredited method provides, for the first time, chemical traceability for instruments measuring LNG composition directly (without the need for a vapourisation stage). To find out how EffecTech can help you calibrate your LNG analyser, please contact us. 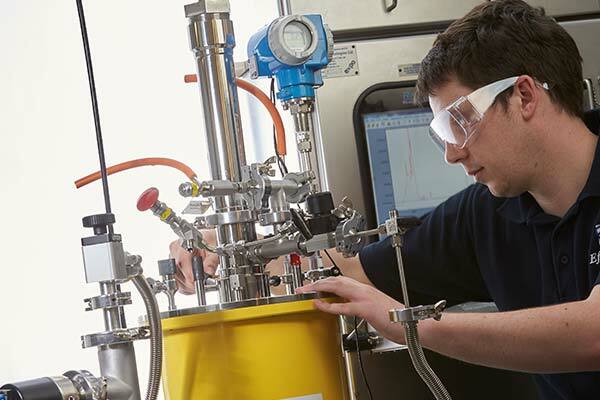 Direct measurement LNG analysers do not need to vapourise the LNG prior to analysis and this is seen by many as a distinct advantage as it removes the issues caused by the vapourisation step. If the LNG sample is not fully vapourised instantaneously, there is a risk of fractionation and enrichment which can compromise the representativeness of the sample. Direct measurement therefore, in principle, can have lower uncertainties than the vapouriser/gas chromatograph (GC) combination method currently used. What are the issues with LNG sampling? EffecTech developed the bespoke facility for the calibration of LNG analysers at its specially designed research laboratory in Uttoxeter, UK. The research team was led by Dr Paul Holland, Business Development Director, with Drs Gergely Vargha and Joey Walker. EffecTech® is at the forefront of LNG quality measurement techniques and would like to work with partners in industry to develop LNG gas quality measurement standards. If you have a project you would like to discuss, please contact us. The cryostat is an LNG calibration device. Pre-vapourisation and enrichment occur when the LNG sample is not completely vapourised in a single step.